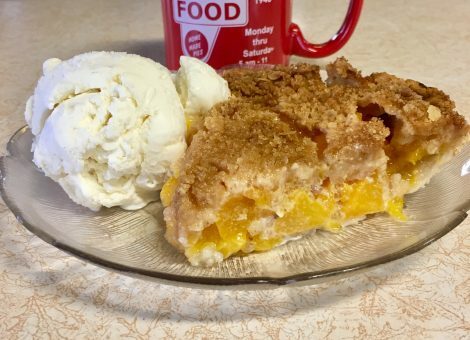 Sweet peaches with a brown sugar crumble topping makes for a delightful indulgence. Homemade Biscuits n’ Sausage Gravy topped with Crispy Chicken Tenders and two eggs. Served with warm syrup and free tea or coffee. A Family Treat to Eat with Us! Schmucker's Restaurant has been a Toledo dining tradition since 1948. 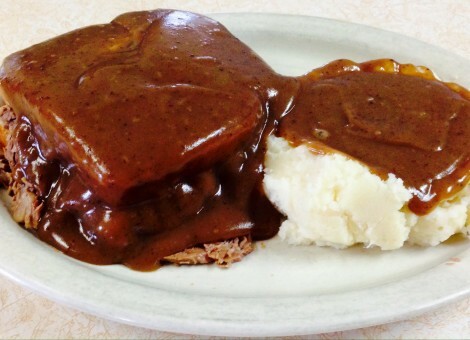 Family owned and operated, Schmucker's features delicious homemade meals like Grandma's Swiss Steak, Chicken over Biscuits, Meatloaf, Pork Chops, Fried Chicken and more. Watch the cook at the grill from your counter stool or your cozy booth. Schmucker's pies are available in over 20 varieties including Chocolate Peanut Butter, a cream pie favorite. For breakfast, lunch, dinner, and dessert, enjoy an authentic home-cooked diner experience at Schmucker's Restaurant! 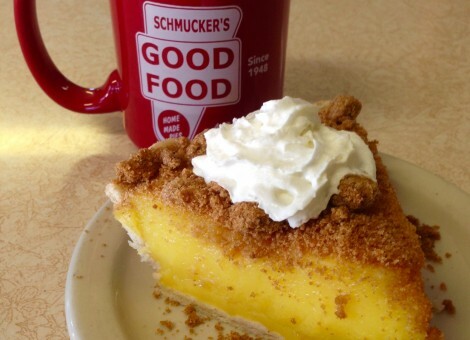 For dessert, try a slice of Schmucker's famous homemade pie!